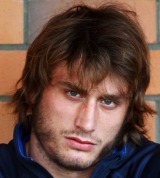 Maxime Medard is a fiercely quick French international who plays on the wing or at fullback for Toulouse. Medard joined Toulouse in 2000 and rose through the junior ranks before making his first-team debut in 2004. His breakthrough season came in 2007/08 as he took advantage of injuries to the established Vincent Cler and Clement Poitrenaud to star in the French Top 14 competition. Having been a regular at junior levels for France, Medard made the step up to the senior squad in November 2008, winning his first cap against Argentina. This led to him being selected for the 2009 Six Nations and later that year he scored a late try as France beat the All Blacks in New Zealand for the first time since 1994. However with France coach Marc Lievremont's constant tinkering of starting line-ups Medard was regularly in and out of the national side. After sitting out the 2010 Grand Slam triumph, Medard was out to make amends and started the 2010-11 Top 14 season in spectacular fashion scoring the fastest try in league history since 2005 after 18 seconds against La Rochelle. Medard was a key part of the French 2011 Six Nations side playing in four of their five games and scoring two tries in the process. Come the 2011 World Cup, Medard featured prominently for Les Bleus but only scored one try -but it was a crucial score as it came in their 19-12 win over England in the quarter-finals. And with the 2012 Six Nations beckoning, Medard shone for France in the first two games of the tournament. He scored in their second match against Scotland - starting at fullback - but sustained an injury to his cruciate ligament which will keep him on the sidelines for six to nine months. Medard was recalled to the French squad for the 2013 Six Nations, coming into the reckoning as an injury replacement ahead of the tournament.